It takes a little while to cut out the cards and the board and works best once laminated but your students will love this revision activity. The questions are designed to boost subject knowledge and focus on precise historical detail which in turn helps student examination performance. Allow students to use Ipads or Internet devices to research answers depending on their level of subject knowledge. At IB/A Level I expect students to answer unaided but at GCSE/IGCSE and below I use this activity as a research lesson and allow them to research responses. 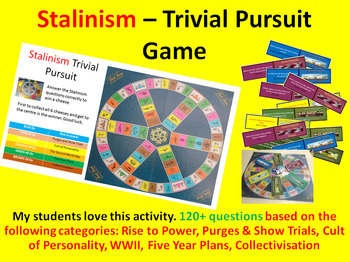 I hope your classes enjoy this activity as much as classes always do! Its one of my favourite revision activities.